Click to Email / Or Call 01494 716947 Genuine email enquiries are always responded to within 24 hours. If you do not get a reply please assume your email was not received. Beautifully costumed experienced dancers available for hire. We specialise in choreographed performances of either Belly Dance or Hawaiian Hula, and include some Tahitian Otea in our Hula performances as required. All dance styles performed are genuine, authentic, not 'in-the-style-of' and not any type of fusion. We accept fee paying bookings only. We also offer audience participation and interaction, Hawaiian Sing-Alongs and Ukulele performances and Hawaiian Lei & Song Greetings. 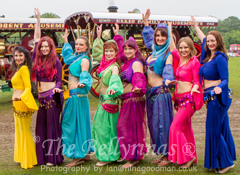 Our Belly Dance style is high standard, glitzy Egyptian Cabaret in sparkling bespoke costumes designed and created by Tina-Louise and members of the troupe; and may include Veils, Zills, Isis Wings, Veil Fans, Poi, Voi, Feather Fans, Gym Ribbons and other props. Our Hawaiian Hula style is 'Auana'. Our bespoke costumes are all designed and created by Tina-Louise and include genuine grass skirts, hip hei, and luxury lei. All choreography is by Tina-Louise. All our dancers train with the school and we do not recruit outside performers. The act is suitable for audiences of all ages. Please see a brief outline of our services below. For full details & fees, please email with as much information about your event as possible including date, time & length of performances required, space available & full venue address. Choreographed performances by two or more dancers. Our Belly Dance acts are usually 15 minutes long but can be anything from 90 seconds up to 30 mins according to requirements. Audience participation & interaction can be added, and photo opportunities with the dancers are complimentary. You may book two or more dancers subject to availability and space available. Fees start at £295 for two dancers. Lead time is preferably 3+ months. As our performances are tailored to suit each event, this gives us time to secure and prepare the appropriate dancers and routines for your requirements. The more dancers/performances you require, the longer the lead time needed. We require an adequately sized hard floor performance area, full advice on the space required will be provided when you contact us. Please note that our larger acts including props will require a very large space and are best suited to a theatre style setting. We require a private, adequately sized changing room. We don't expect to be fed or watered! We accept bookings for events located within 25 miles of High Wycombe, Buckinghamshire and West & Central London. Choreographed performances by two or more dancers. Our Hula Dance acts are usually 10 minutes long but can be anything from 90 seconds up to 30 mins according to requirements. Audience participation, sing-alongs and ukulele performances can be added, we also offer lei and song greetings as your guests arrive. Photo opportunities with dancers are complimentary. Lead time is preferably 28 days or longer. Please note we are busiest during the summer months, so plenty of notice is advised. As our performances are tailored to suit each event, we need time to secure and prepare the appropriate dancers and routines for your requirements. The more dancers/performances you require, the longer the lead time needed. We require an adequately sized hard floor performance area, full advice on the space required will be provided when you contact us. Britains Best Belly Dancers United Kingdom, Belly Dancers Buckinghamshire, Belly Dancers Berkshire, Belly Dancers Hertfordshire, Belly Dancers Oxfordshire, Belly Dancers Middlesex, Belly Dancers London, Belly Dancers High Wycombe, Belly Dancers Beaconsfield, Belly Dancers Slough, Belly DancerWindsor, Belly Dancers Eton, Belly Dancers Maidenhead, Belly Dancers Reading, Belly Dancers Henley, Belly Dancers Marlow, Belly Dancers Amersham, Belly Dancers Chesham, Hawaiian Luau, Arabian Nights, Morrocan Evenings, London Luau, Party Entertainment, Hawaiian Hula, Hula Dancers, Hula Girls, Tahitian Dancers, Britains Best Hawaiian Hula Dancers United Kingdom, Hawaiian Hula Dancers Buckinghamshire, Hawaiian Hula Dancers Berkshire, Hawaiian Hula Dancers Hertfordshire, Hawaiian Hula Dancers Oxfordshire, Hawaiian Hula Dancers Middlesex, Hawaiian Hula Dancers London, Hawaiian Hula Dancers High Wycombe, Hawaiian Hula Dancers Beaconsfield, Hawaiian Hula Dancers Slough, Hawaiian Hula Dancers Windsor, Hawaiian Hula Dancers Eton, Hawaiian Hula Dancers Maidenhead, Hawaiian Hula Dancers Reading, Hawaiian Hula Dancers Henley, Hawaiian Hula Dancers Marlow, Hawaiian Hula Dancers Amersham, Hawaiian Hula Dancers Chesham.